An architectural trail through the historic Marais neighborhood of Paris. It’s not that the Marais neighborhood of Paris is new or anything. Its heyday was from the 16-18th Centuries. But for being so close to the main tourist routes of central Paris, it has a distinct feel and a separate story. And it’s new to me. We walked the Paris Marais district in late May with Nicole of Context Travel, and discovered history, architecture, and, yes, trendy new spots in this relaxed area. 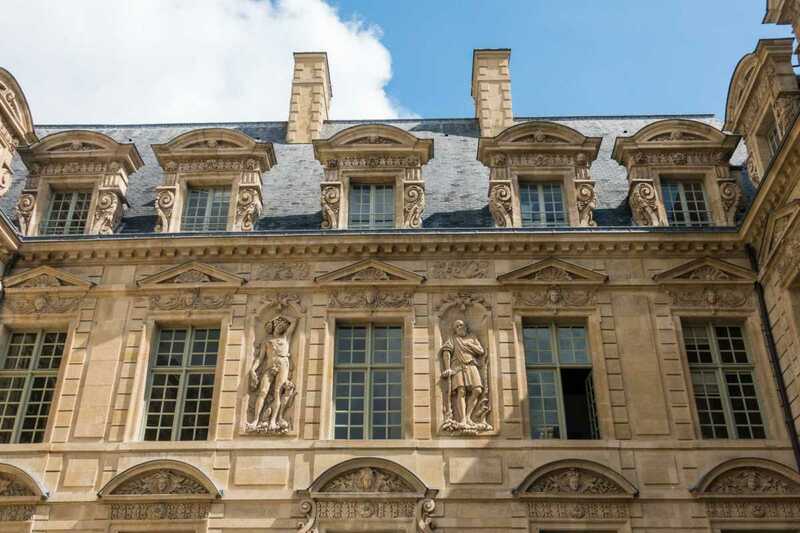 The Marais Mansion walking tour by Context is focused on the homes of the aristocracy in this area along the Seine’s Right Bank just east of City Hall and Notre Dame (roughly the 4th arrondissement). But it allows visitors to see the medieval roots of this area, too. ‘Marais’ means ‘marsh’ in French, and it’s plain to see this flat district wasn’t always protected from the vicissitudes of the river. A few sections of medieval wall remain visible (constructed from 1190). The earliest main street, Rue Francois Mirón, connects City Hall to Saint Paul Church. 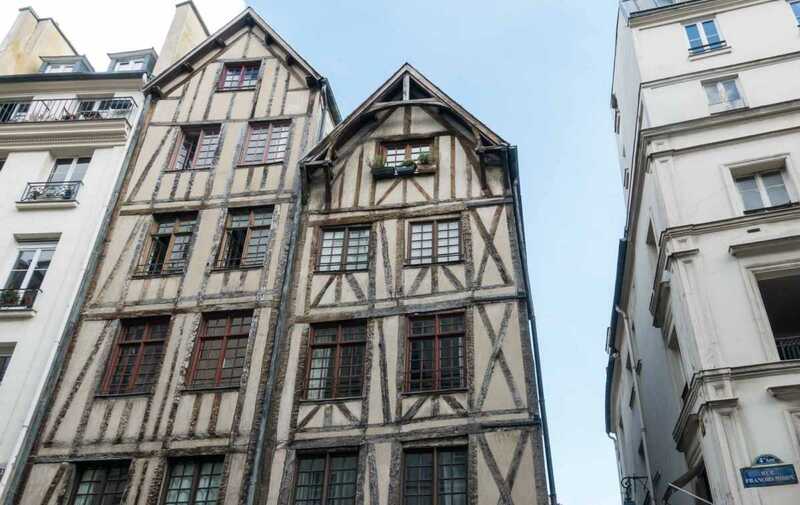 Along here are fine examples of the crammed-together five- to six-story wood-framed medieval homes. Teetering over the street, they seem to hold each other up. By the early 16th Century, these wood structures were banned. In fact, “Good King” Henry IV of Navarre (1589 to 1610) was known as the Brick Builder. Starting in the late 1500s, Marais became the neighborhood of the aristocracy. Their mansions are scattered along the stretch from City Hall to what is now Place de la Bastille and northward to today’s 3rd arrondissement. The architectural details–with a knowledgeable guide–describe the powerful people of the day. Parisian architecture is still one of the happiest results of the Renaissance. Hôtel de Sens – Originally owned by the archbishops of Sens. 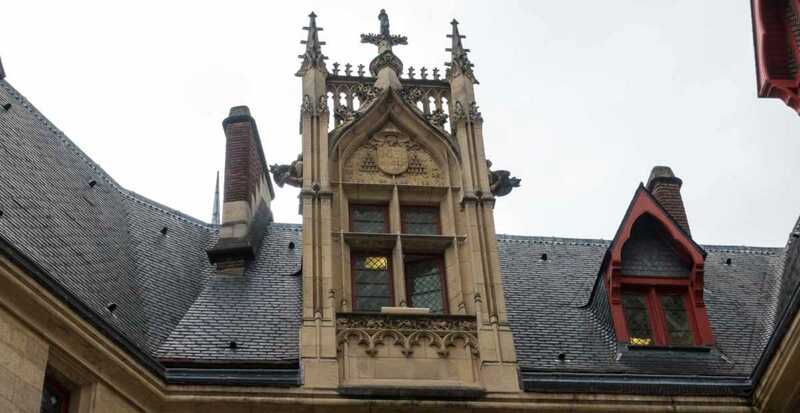 Built 1475-1507, the upper levels include Gothic references and are more flamboyant to recognize the close association between the king and the church. Hôtel de Sully (1624-1630) is a magnificent example of a private mansion, built with two courtyards and orangeries. It was designed to open back onto the Place Royale (now Place Vosges). This mansion stayed in the Sully family for 200 years. It’s now home to the National Monuments Center. 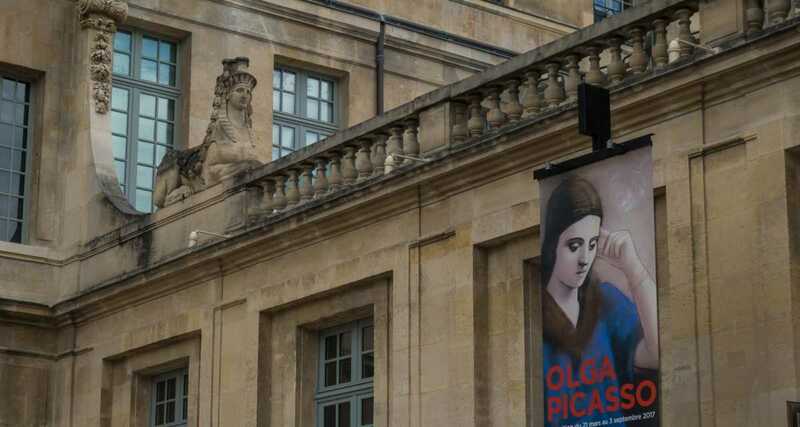 Hôtel Salé, now the Picasso Museum, built 1656-59 for the salt-tax collector, hence the name. It’s an enormous, elegant space…which we saw from the outside. Must return, of course. Hôtel de Soubise – Built for the Prince of Soubise on the site of a former manor, then later remodeled. No photos were allowed inside to capture the Rococo central hall and stairway. The renovation by the Prince’s son, Rohan, around 1705, included adding a second mansion across the grounds. 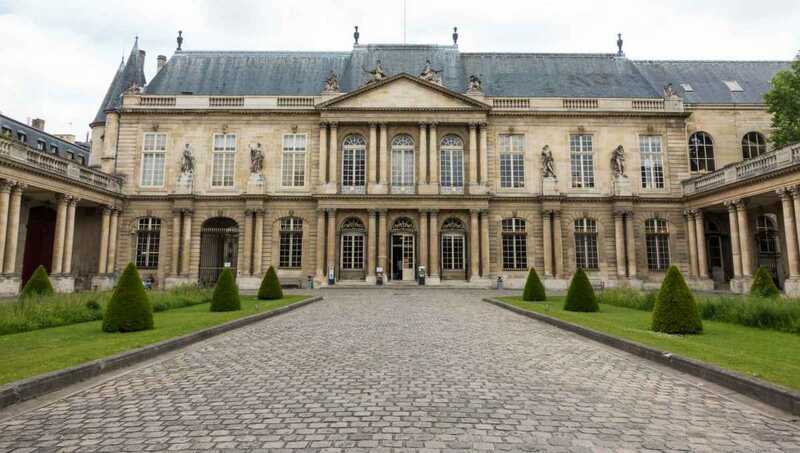 Today, Hôtel de Soubise contains part of the National Archives. 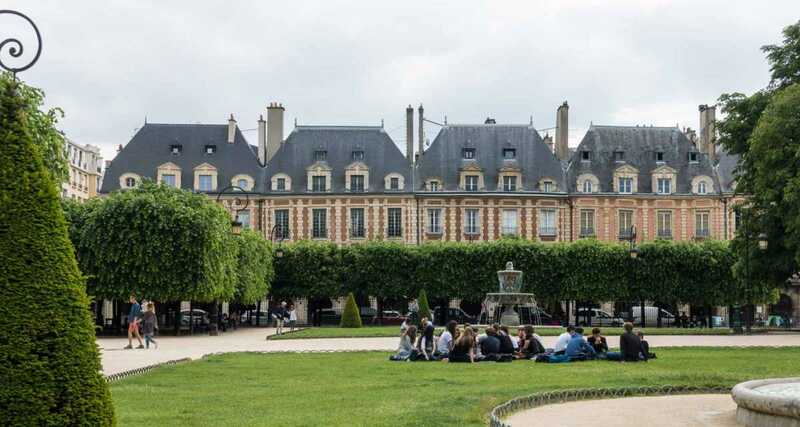 The Place de Vosges is one of the more pleasant surprises of a walk through the Marais. The aristocracy, naturally, needed their public square. This was one of the first in the world to be constructed according to plans, surrounded by uniform housing, and featuring a fountain and statue of the king in the center. Even today, the groomed trees and overall symmetry offer a calm and relaxing space. 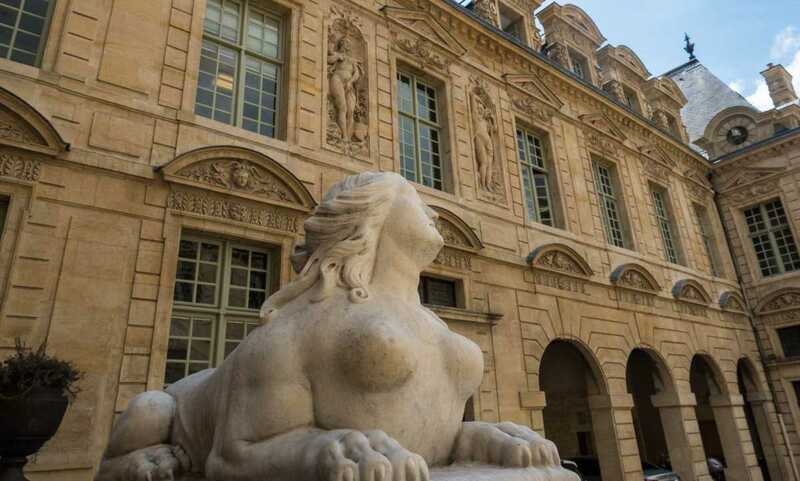 The Marais district began to shift with the construction of Versailles in 1675. Architects and aristocrats gravitated toward Versailles. (This tour would make a great prelude to Context’s French Revolution tour, by the way.) By the 19th Century, the whole Marais neighborhood fell into decline. Thanks to the groundbreaking Malraux historic preservation act of 1965 (named for then Culture Minister Andre Malraux), funds were devoted to restoration of the mansions, and the entire neighborhood was protected from demolition. Unlike other historic Paris neighborhoods, the Marais has largely retained its character–and continuous to develop its own personality. A word to visitors: Different mansions may be open for viewing on different tour dates, but there are so many options there’s no room for disappointment. Also, many mansions have bookstores (notably Hôtel Soubise), so even if you can’t visit the deep interiors, you can enter that far. Walking with Context through the Marais we could see how lively it is currently. Around the corner from a fashionable Ben Simon shoe store, for example, we see well-placed graffiti by the French urban artist Invader. Bistros and brasseries dot the streets, and there are plenty of hotels for us to choose from should we want to stay here next time. There’s a good chance we’ll be returning to the Marais next time we’re in Paris. Note: We were hosted on this walking tour by Context Travel. Our friends and readers know we seek them out wherever they lead tours because we admire their docents and really enjoy the insights they share. Opinions expressed here are the authors’ alone, and have not been reviewed, approved nor edited by Context or any other company whose links may appear here. That also means factual errors are all ours. I love the Marais, especially Place des Vosges. I realized, however, I need to look up more. I don’t recall those houses on Rue Francois Mirón! Will have to check that out the next time I’m in Paris! There are just a handful of these medieval houses standing. I think these were restored early in Paris’ preservation efforts–in the late ’60s or early ’70s. Fabulous post! I love taking walking tours and meandering into different neighbourhoods to explore the sites. Thanks for introducing me to Marais. Thanks, Doreen. I’m especially thrilled when these tours show me stuff I’ve walked by but never noticed or appreciated. So worthwhile! I was there a lot of time ago, and I didn’t see it properly. I think that it’s time to get back. Thanks, Carmen. I would never have known what I was seeing had I not taken this tour. Sometimes I’m amazed at what we can walk right past without noticing or understanding the background. This was lots of fun. I confirm. It is truly one of the most charming places in our city, a site not to be missed if you are visiting Paris.